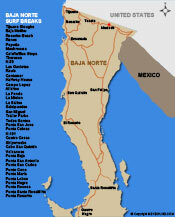 Welcome to the mexbound.com Baja guide to surfing Northern Baja California. Youll find all the info you need on some of the regions best spots, as well as info on when to head Mexico-way to make sure you score the waves youre looking for. When Surfing Baja, you can leave all your problems at the border. Just imagine: surfing with just you and your friends, perfect waves, and no crowds! Its not some fantasy world; surfing Baja California has everything you could want. Relaxed environment, cool people, cheap and tasty tacos and lots of cold cervezas. Just make sure you get MEXICAN INSURANCE before you leave! In Baja Norte, or to us gringos, Northern Baja, the surfing is amazing. Northern Baja California has some of the best Baja Surfing, particularly on a south or southwest swell. When surfing in Baja the conditions are somewhat similar to Southern California. During the months of October to April the water temperature ranges between 50 and 60 degrees, so it is always best to wear a full suit and possibly booties. Swells during the winter period typically come from the west to northwest and are fairly consistent. During the winter months, with the exception of Hawaii and a few other random spots, the waves at Islas Todos Santos off the coast of Ensenada are said to be the biggest waves in the Pacific.